Cecilia Winter,"Música Regional Oaxaqueña de ayer y hoy, Transcripciones para órgano y piano", Carteles Editores, 2018. 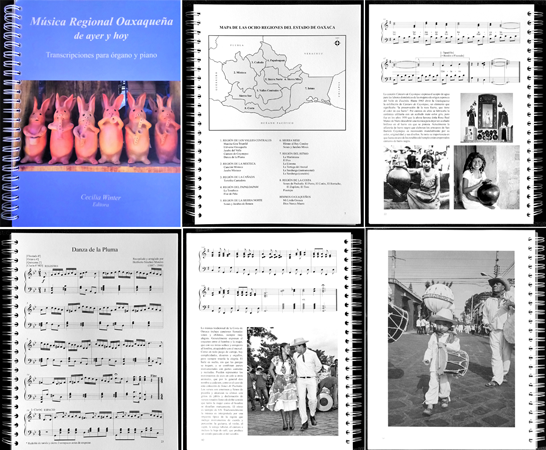 This book of transcriptions of Oaxacan regional music was inspired by the discovery that Oaxaca’s historic pipe organs could sound like a wind band when playing local folk music. This is not entirely surprising since the organ is also a wind instrument, although by far the largest and most versatile, and its numerous pipes can produce sounds similar to those of flutes, trumpets, and trombones. In recent years, Oaxaca has become the historic organ capital of Mexico with 11 restored instruments, more than any other state, and the organs are increasingly recognized and appreciated as unique cultural treasures. But it is also the center for wind instrument bands, the premier interpreters of festive and religious music in the local communities since the late 19th century. This book, as well as the concerts and the CD which proceeded it, fuse these two important musical traditions for the first time. We hope that organists, pianists, and other keyboard players will enjoy playing this exciting music. The book is in Spanish with an introduction and technical recommendations in English as well. Its 104 pages include 24 scores of songs and dances, mainly from the Guelaguetza, Oaxaca’s annual folk dance festival, background information about each piece, photographs by the publisher Claudio Sánchez of the dances or the corresponding regions, lyrics of the songs, and biographies of the composers. The pieces are harmonized for keyboard and thus may serve as a basis for any instrumental ensemble. The proceeds from the sale of the book will support the work of the IOHIO. For now we are concentrating on local distribution but will soon send instructions for national and international orders. Cicely Winter, "Historic Organs in Oaxaca, Mexico" Part I: bit.ly/vhwinter1, Part II: bit.ly/vhwinter2, in the online organ journal Vox Humana, editor Christopher Holman, 2018. Claudio Sánchez Islas, "Instituto de Órganos Históricos de Oaxaca IOHIO A. C.", Patrimonio Natural y Cultural de Oaxaca Para Principiantes 1a. Edicion. Oaxaca, México, 2014. Click here to access this publication (in Spanish). José Luis Pérez, Cecilia Winter, "Albacea del legado musical de Oaxaca", Mujeres, Número 146 Junio 2014. Ryszard Rodys, Lérida Moya Marcos "Los Órganos Oaxaqueños y sus Artífices", February 2014. Cecilia Winter “Los baúles de San Bartolo Yautepec: historia y presente entorno al patrimonio musical de una comunidad zapoteca”, El Comején (Boletín de las Bibliotecas y Salas de Lectura del estado de Oaxaca), Segunda Época, número seis, julio-septiembre de 2012. Cicely Winter, Ryszard Rodys, "Sor Mará Clara del Santísmo Sacramento and her Family; a Dynasty of Organists and organbuilders in 18th and 19th century Oaxaca, Mexico"
Ryszard Rodys, “Órganos, organeros y organistas de la catedral de Oaxaca,” internet publication of the Instituto de Órganos Históricos de Oaxaca, A.C., Oaxaca, Oax., 2010. Ryszard Rodys, "Who were the Organists of the Oaxaca Cathedral?" internet publication of the Instituto de Órganos Históricos de Oaxaca, A.C., Oaxaca, Oax., 2009. Cecilia Winter, “Los órganos históricos de Oaxaca: una ventana al pasado,” in the Anuario Dominicano, Oaxaca, 1529 – 2006, Vol. II, pp. 369 – 399, Instituto de Investigaciones Históricas, Provincia de Santiago de México, 2006. Calvert Johnson editor, “Cuaderno de Tonos de Maitines de Sor María Clara del Santísimo Sacramento Notebook of Psalm Tones for Matins of Sister María Clara del Santísimo Sacramento”, Wayne Leupold Editions, Colfax, North Carolina, 2005. Click here to read more about this publication. Cecilia Winter, “Voces del pasado: los órganos históricos de Oaxaca,” Acervos Vol. 5, no. 22, pp. 14 – 24, summer 2001. Edward Pepe, “Hacía una tipología de los órganos oaxaqueños,” Acervos (Boletín de los archivos y bibliotecas de Oaxaca), Vol. 6, No. 24, pp. 14 – 22, winter 2001. Sonya Valencia, "Oaxaca Posea un Tesoro en Órganos Tubulares Históricos", Actual No. 99 diciembre 2001. Click here to access this publication (in Spanish). John Collins, Órgano de San Jerónimo Tlacoachahuaya, Vol. I Guy Bovet, Vol. IV Luigi Ferdinando Tagliavini, Instituto de Órganos Históricos de Oaxaca, Mexico. The Diapason, May 2012. John Collins, Órgano de la Catedral de Oaxaca, Vol. II José Suárez Molina, órgano, Horacio Franco, Flauta de pico, Instituto de Órganos Históricos de Oaxaca, Mexico. The Organ, Spring 2013. John Collins, Música Oaxaquena en el Órgano de la Catedral de Oaxaca, Cecilia Winter, órgano y Valentín Hernández, percusiones. Volumne V, Instituto de Órganos Históricos de Oaxaca, Mexico. The Diapason, October 2014. Click here to access this publication.